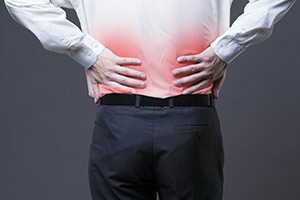 Back pain usually refers to pain in the lower back but there can also be referred pain from higher up – between the shoulder blades for example. Back pain can be accompanied by pins and needles or numbness in the arms, legs or head. Most back pain is due to a breakdown of the normal function of muscles or ligaments. These become strained from overuse where one part of the back is moving too much. Intervertebral disks are sometimes involved in causing pain, but not as often as is sometimes suggested. Slipped disks in our opinion are fairly rare. Often over time the mechanics of the moving parts of the back become uneven, with some areas working too much and others too little. Strain occurs in the areas that move too much, and inflammation or congestion is felt in the area that moves too little. The osteopath aims to even up and harmonise the movement of the moving parts. This spreads the load on the back and alleviates pain. The area that moved too much will stabilise and be less vulnerable to strain. An area that previously had a small range of movement will be encouraged to have increased movement. At our clinic, Ellerslie Osteopaths, we encourage the patient to do specific exercises that will maintain the improved function.